The Armed Forces charity SSAFA has teamed up with the Royal Navy and the Royal Air Force to arrange a special rendition of Bruno Mars’ hit song ‘Just the Way You Are’ in the lead up to Valentine’s Day. The music video features members of the RAF Falcons Parachute Display Team, 815 Naval Air Squadron, 99 Squadron, Royal Air Force, RAF Fire fighters, engineers and other ‘brave recruits’ taking a break from their day jobs to sing, slide, and sway to the love song sending a surprise message home. Acknowledging the thousands of military families living apart, often for weeks at a time, SSAFA, created the ‘top-secret’ music video to help bring separated loved ones closer together this Valentine’s Day. The video was filmed at the Royal Navy Air Station, Yeovilton and RAF Brize Norton. 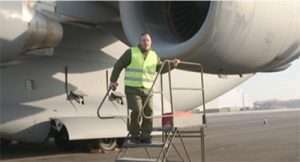 Featured in the clip is Flight Lieutenant Kurt Baldwin, a C-17 pilot based at Brize Norton, who proposed to his wife on Valentine’s Day in 2012. “I jumped at the chance to send a special Valentine’s Day message to my wife and three beautiful daughters as it’s a real family occasion for us. I’m grateful to not be away this year – but I’m hoping this video makes up for all the other special moments I’ve missed in the past.